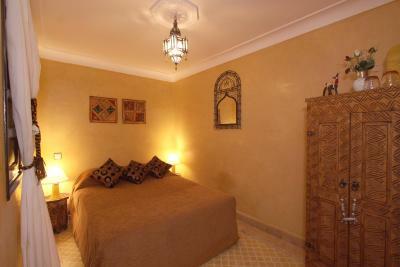 Lock in a great price for Riad Andalla - rated 9 by recent guests. Breakfast is very good. A good range of food and variety. 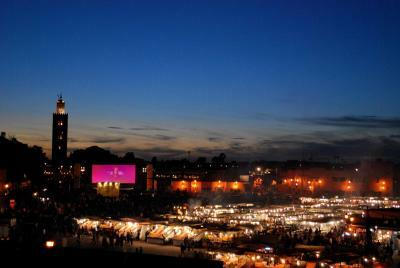 Fresh fruit and cakes, hot and cold drinks, with a spectacular view of the Jemaa El Fnaa Place. 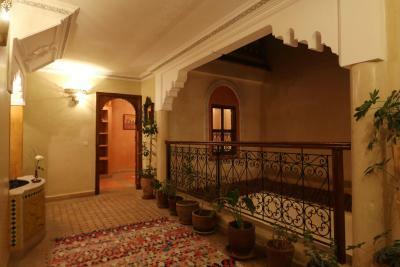 Ideal centre location, and great terrace overlooking the square so benefiting from the atmosphere without being to noisy. Really helpful staff may our brief stay easy. 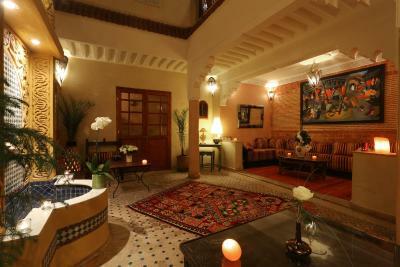 Lovely place to stay in Marrakech. Fabulous location and great view from the terrace. Breakfast on the terrace overlooking the square was a very nice way to start the day. 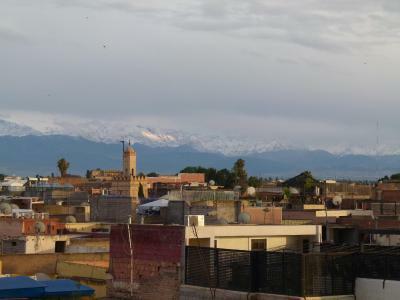 The hotel is well situated for the main square of Marrakech although it is not accessible by car and involves a walk down some alleys which also makes it hard to find. The hotel sent someone to meet my taxi without whom I would have had problems finding it. 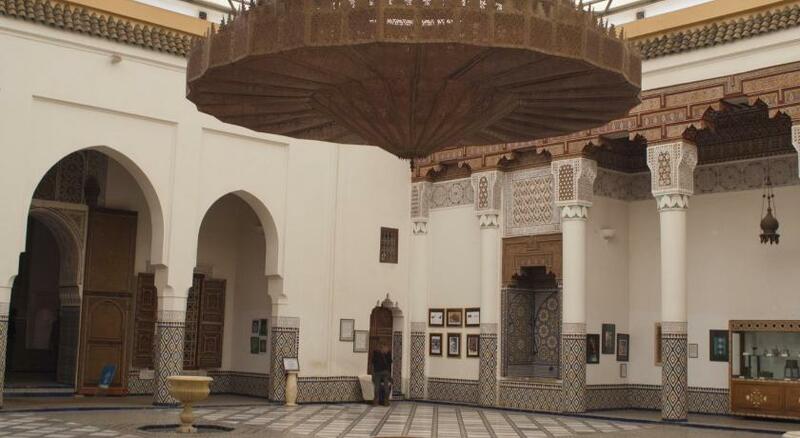 There is a pleasant roof terrace from which there is a view of the square. The owner was so friendly and helpful with recommendations of what and where to go, you can have breakfast downstairs or on the terrace. 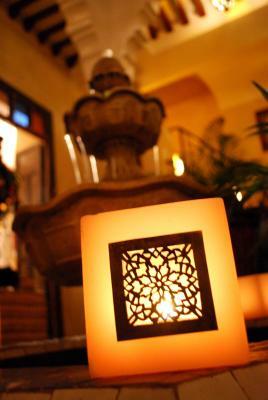 Relaxed atmosphere with wine as an option and reasonably priced. Location : Amazing Amenities: Excellent Staff : They treat you like family (Royal Family), the level of service is beyond outstanding, they go out of their way to meet all of your requests, nothing is impossible here. 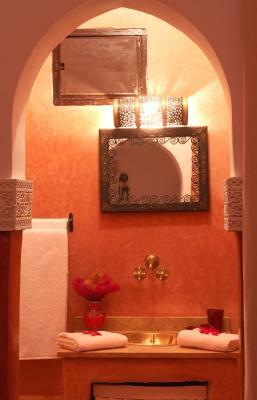 If you desire a true Moroccan experience with excellent service at good value, please check this Riad I recommend it strongly. We loved it so much we went back for more 3 days. Location : Amazing Amenities: Excellent Staff : They treat you like family (Royal Family), the level of service is beyond outstanding, they go out of their way to meet all of your requests, nothing is impossible here. 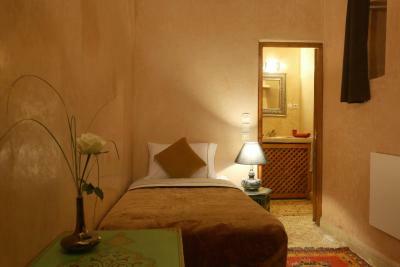 If you desire a true Moroccan experience with excellent service at good value, please check this Riad I recommend it strongly. 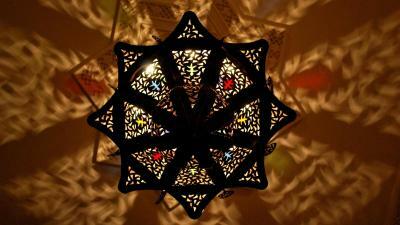 Loved Abdule and the Riad Andalla staff! Always smiling, always polite, always helpful... they absolutely made our trip one to remember. 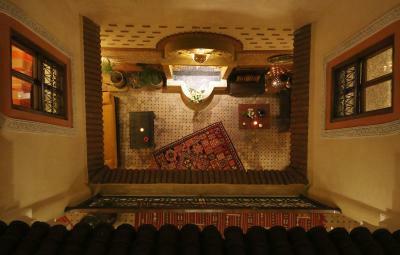 Breakfasts were very nice; and we recommend having dinner(s) at the Riad as well. Abdule provided great insider info, and coordinated a couple of excursions for us which saved us nearly half of what we would have paid! Rooms and facilities were nice... price was right... and you couldn't beat the location! 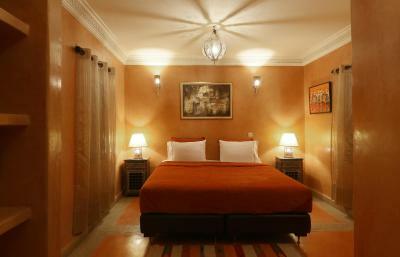 Riad Andalla is located in Place El Jemaâ Square in Marrakech and a 10-minute walk from Koutoubia. 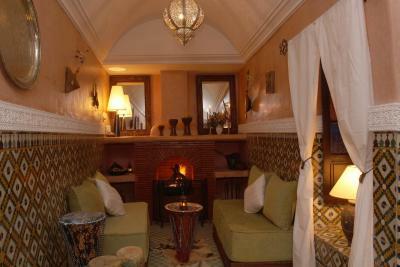 Guests can relax on the terrace with views of the square and the Medina, or in the Moroccan lounge with a fireplace. 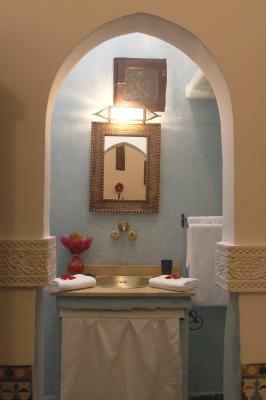 The rooms at Riad Andalla feature Moroccan architecture and traditional Moroccan decor. 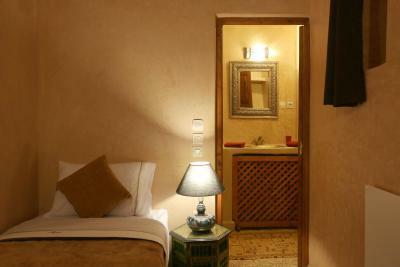 Each room offers free Wi-Fi and air conditioning, and some rooms are accessible for guests with reduced mobility. A continental breakfast is served every morning. 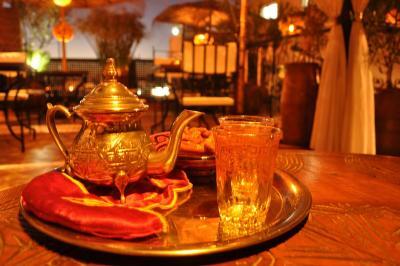 Upon reservation, guests can enjoy traditional Moroccan dishes served on the patio or on the terrace. 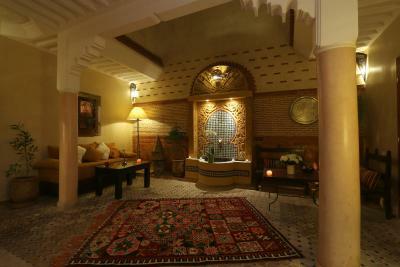 The Marrakech-Menara International Airport is 20 minutes away and the Majorelle Garden is 2.5 miles away. 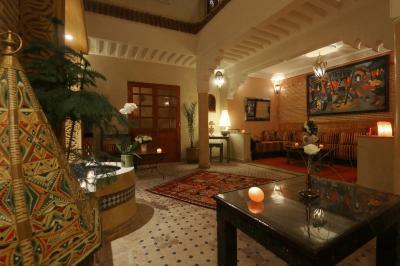 The hosts can organise excursions in Marrakech and airport transfers. 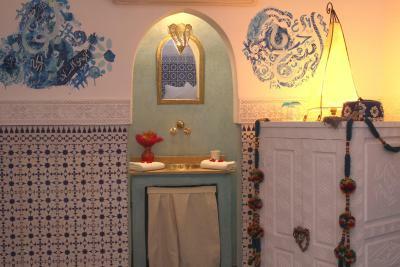 Riad Andalla has been welcoming Booking.com guests since 19 Dec 2012. 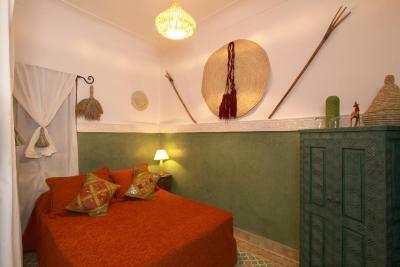 When would you like to stay at Riad Andalla? 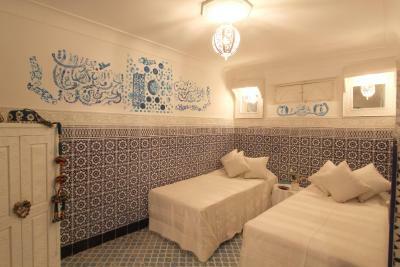 This air-conditioned room features free Wi-Fi and an en suite bathroom with a shower and free toiletries. Extras include a seating area with a sofa and more space. 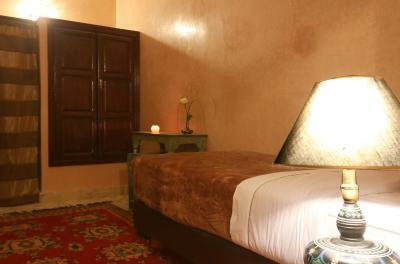 Located on the ground floor, this room offers free Wi-Fi access and an en suite bathroom. 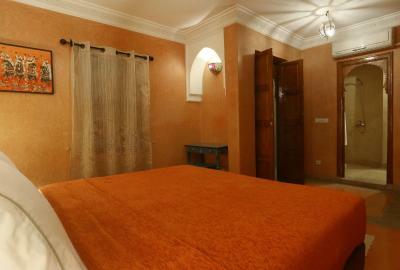 This triple room offers free Wi-Fi access and an en suite bathroom. 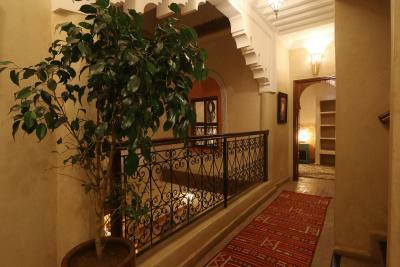 House rules Riad Andalla takes special requests - add in the next step! 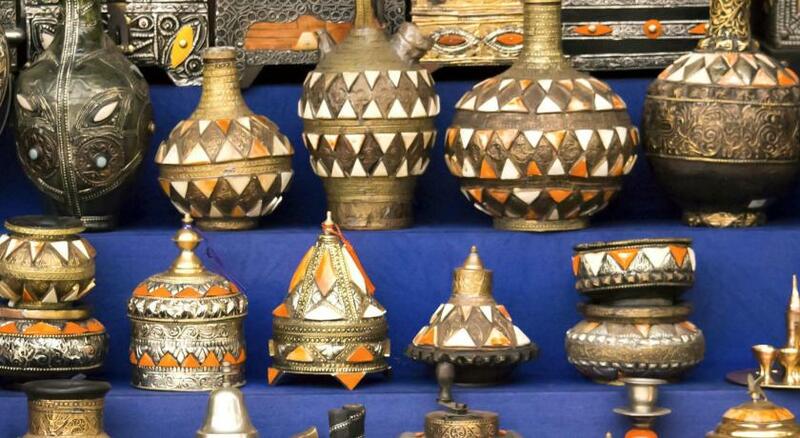 Riad Andalla accepts these cards and reserves the right to temporarily hold an amount prior to arrival. Great position with excellent welcoming staff. 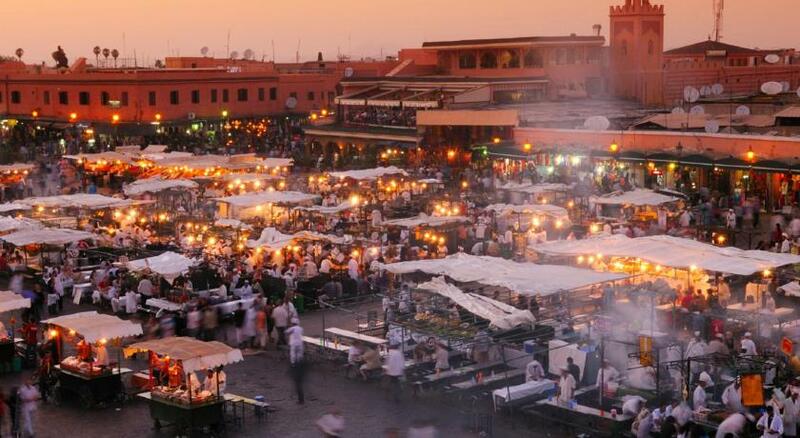 We had the provided diner on terrace overlooking the market square with sun setting and call to prayer playing. Just beautiful. 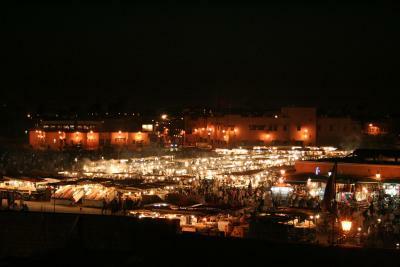 Dinner was 3 course with white table cloth and traditional Moroccan fair. Very good. 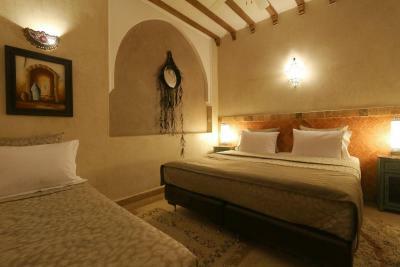 We would stay again and recomend. The location is not really well signaled, a guy was standing on a junction to show the riad for a tip. The personal doesn't seem trained for hospitality, but they are very very kind The free parking is not true, you have to pay, and part of it will be refunded. We have been served a rotten pancake for breakfast, it was even prepared few minutes before, without cook noticing The riad had a recent owner changing, so we had to wait for more than 1.5h to get our room. At 2:30pm They don't use the day currency exchange rate, been charged 6 euros more, The rate is a bit expensive for the quality of room We didnt have the welcome/safety/information breif The doors are hard the operate, not practical. One bigger size door leaf would be much better. The room was compact and bijou to say the least. There was also a drain smell.it was possible to use the basin without getting water everywhere. The rooms dont really have a view, but that's the only thing I would have to say, everything else was just great! 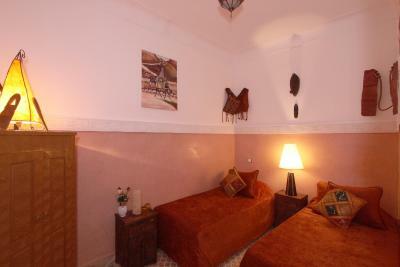 Great Riad very very close to the big Jema el Fnaa square in the city center of Marrakech. Nice views over the square from the rooftop during breakfast. Very elaborate breakfast and friendly staff! 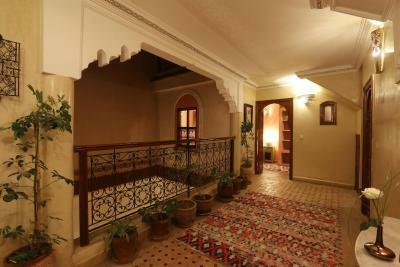 In my mind a riad should be a quiet peaceful retreat from the noise and hustle of the city. Unfortunately that message does not seem to have been conveyed to the staff yet. 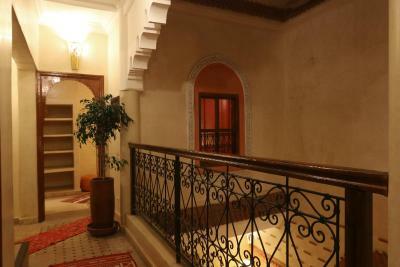 Typical of a Riad construction the sound transmits up from the courtyard to the rooms and consequently the music and talking of the workers staff disturbed the peacefulness of our visit. Roof top patio was awesome. Staff was accommodating. Location was super convenient. 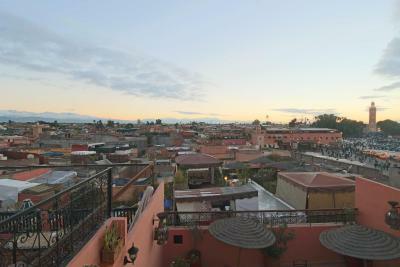 The Riad had a great location and good breakfast, but unfortunately the bad experiences outweighed the good. 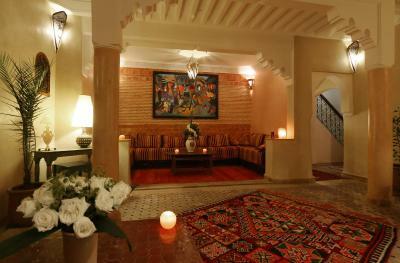 We paid Riad Andalla 15 Euros for a taxi from the airport to the Riad. Upon confirming the taxi we were told someone would be waiting for us with our name on a sign; so when we arrived we wandered around looking for our driver. After some time a gentleman came up to us as he could see we were lost; he then proceeded to call someone- maybe our driver? We did finally get a driver, but not the person we were expecting. Upon arrival at the Medina the driver dropped us off near the gate and told us he couldn't drive into the Medina- then he found someone (who we had to pay) to walk us to Riad Andalla. Our room was on the top floor and had one window- when we were in the room we had to keep the outside door open just to see- there were lights that were burnt out in the room, but even if they had been working I doubt it would have made things better. The final issue was upon departure- we hadn't been to the reception area until it was time to pay the bill (when we checked in they seated us in the breakfast area)- they had a sign posted that stated there was a 5% additional charge for credit cards---had we known this in advance we would have gotten cash to pay, but we didn't have time and had to get to the airport. 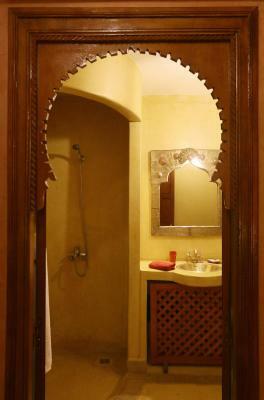 We stayed in three other Riads in Morocco and they did not charge extra for credit cards. Upon leaving we were wise and didn't have the Riad arrange for our transport to the airport- we found someone who did it for 10 Euros! My room was very small with just enough space for the bed. I had to sit awkwardly on the end of the bed to use my laptop on a shelf. There was no room for a chair. 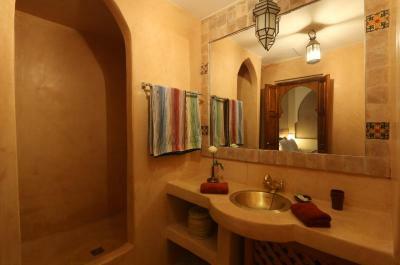 Looking at the entry on Booking afterwards I realised that a wide angle camera was used to make the rooms seem much larger than they really are. 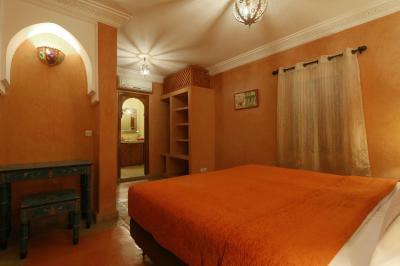 This is really more of a backpackers' hostel than a hotel. Rooms do not have locks so I had to insist on the staff finding a padlock so I could secure my stuff when I was out. Having said that, staff were very friendly and did their best to help. You have to pay 5% extra if you pay with your card. Staff extremely friendly. 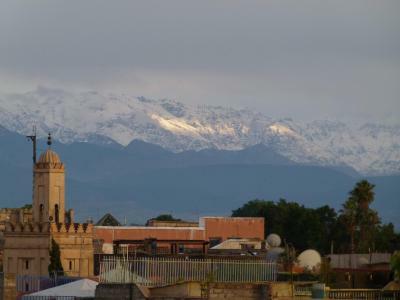 Excelent location.